We love parachute games! They are great for some large scale play with a group of children and are wonderful for promoting team work and listening skills, as everyone needs to work together to follow instructions and listen to cues to make the games work. You can play parachute games inside or out, with a play parachute or a big piece of fabric or a bedsheet. You don’t even need a whole class of children – I’ve played this happily as a pair with a toddler who loved bouncing their teddy on the sheet. Follow the leader: Have someone be the leader and give the rest of the group instructions – and of course the leader can be one of the children rather than the grown-up! Try giving instructions to walk to the left, skip to the right, hold up high, couch down low, shake the parachute gently, shake the parachute quickly. Add some bounce. You can add a seasonal element or fit parachute play to a theme by adding some props on to the top to bounce around while you play. Cotton wool balls make great snow, and we use fir cones in the autumn. We find teddies love a ride and balloons add a dash of chaotic fun! As well as having the children work together around the edge of the parachute, have them listen out for instructions that apply just to themselves. Have everyone lift the parachute way up high and then give instructions for children to run underneath the parachute if they are wearing something green, if they have brown hair, if they like eating bananas and so on. Sherry and Donna from Irresistible Ideas have some great photos of their children enjoying parachute play with music and show how working together means you can even make your bouncing teddy hit the roof! We’re always looking for new inspiration – what ideas for parachute play have you tried? We play with our parachute outside every summer, but I don’t think I have ever posted about it. Great idea! We have the children each hold a handle on the parachute and then walk, run, gallop, tip toe, etc. around in a circle while holding on. Thank you for sharing your ideas. I’m a clown and I use my parachute on a regular basis. My favorite prop is my rubber chicken. The kids love tossing “Wilbur” into the air! I love it Rachele – I would never have thought to add in a chicken! 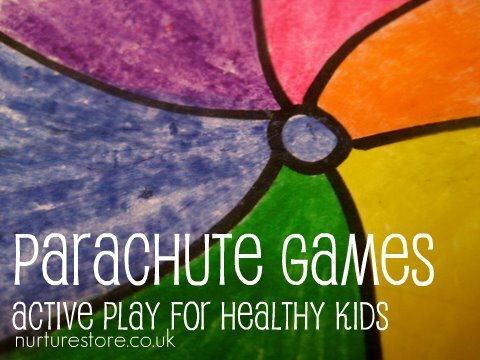 I wrote a blog posting about parachute play. I included you in my resources! Thanks for the post inspiration! Thanks Rachele – on my way over now for a read. Great ideas! We’ve loved doing the parachute in our small co-op preschool and taking it to the park when we meet as a group. Thanks for the ideas. I just pinned this on Pinterest to share the idea. What a wonderful idea! Does the sheet ever break? These are great ideas. Thank you! I like to tie a white napkins on to small styrofoam balls to make them look like ghosts. Then the kids try to contain the ghosts while listening to Ghostbusters. These are great! We like doing itsy bitsy spider and wheels on the bus. Fun parachute game: each child receives a colored plastic cup (I use easter egg dye cups & plaid drinking cups) filled with matching colored pom-poms. Children dump their cup full of pom-poms onto the parachute. We shake until all the pom-poms are mixed up or fly off. Then each child collects his/her pom poms and we begin again. Pop the bubbles. A few kids crawl on top while others make waves and kids pop them. Also cat and mouse. One kid under and another on top. Others shake parachute. Tell mouse (under) to start crawling and the cat (on top) tries to find.